Front pattern. Made of forged steel, the Natural Balanced Shoe™ design resulted from field research involving the natural wear patterns of unshod wild horses. 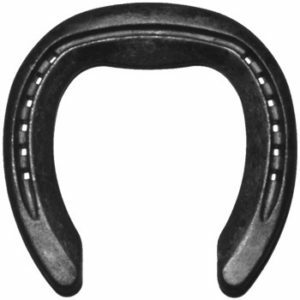 The unique design provides a wider base of support while protecting the hoof. A higher inside rim improves traction and, along with a rolled toe, enhances break over in any direction. Additional nail holes allow more nailing options in poorer quality hooves.